As you are all aware - at Bluesfest we never sleep - and always have NEWS for you we wish to share, about our artists, announcements and of course up to the minute ticking info (hint they are selling VERY FAST!). As you are aware - at Bluesfest we never sleep - and always have NEWS to share, about our artists, announcements and of course, up to the minute ticket info (here's a hint - they are selling VERY FAST!). Our last 2 announcements have garnered a huge response from all Music lovers and here is a snippet. Lindsey Thompson - OMG!... DAVY KNOWLES, this is incredible, I can not believe what a line up this is.....is it wrong to be more excited about this artist announcement than The Legendary Neil Young or Barry Gibb? I think not.....this announcement is top notch Blues. Now I'm pumped. Garry Jacobson - You bewdy.......now we talkin the blues . Great to see our best home grown guitar player Jeff Lang added. Excellent group of additions Bluesfest. tedhadson - Rhiannon Giddens was my highlight of 2016. Space5279 - Really excellent announcement. Madness, Slightly Stoopid, California Honeydrops, Mountain Goats, The Record Company, Billy Bragg & Joe Henry....complete icing on the top!!! And of course the perennial return of TJW. And really looking forward to Miles Electric Band. How good will that be??? Along with Snarky Puppy, we can really get our jazz fusion fix!!! Have you got your tickets in the bag? Then you can fly right past this paragraph BUT just in case you have not booked your accommodation yet and are tempted to camp at Bluesfest (the only place to be), we still have the famous and much loved Tent Motels available, since we were able to increase the allocation. Tent Motels (available to 5 day Festival and Camping ticket holders only) are the best place to stay! They are hassle and stress free. You arrive on site to a pre-set up tent, complete with an awning, carpet, 12v light and stretcher beds plus roll up windows. It's your home away from home, all you need to do is bring bedding. If camping is not for you, there are plenty of other options for accommodation in the local area and please check out our accommodation tips on our website here! Our much sought after Ticket 'Time to Pay / Layby' option is still available. Paying off your tickets in 4 easy payments over 3 months, makes it easier on the budget. However, this option will run out very soon folks, as the Festival is fast approaching. Read more about ‘Time to Pay’ here! To say we are looking forward to spending the next Festival with you, is an understatement – we are beyond excited to be celebrating our 28th Bluesfest with you, and are already counting down the days to Thursday 17th of April! It’s only 146 to go! We are so excited to be welcoming one of Australia’s most successful artists EVER to Bluesfest. Barry Gibb’s career is mind boggling - As a songwriter he’s has had No. 1 songs in the 1960s, 1970s, 1980s 1990s and 2000s! His band The Bee Gees has some famous fans including Michael Jackson who said “I cried listening to their music. I knew every note, every instrument" and Beyonce who remarked “The Bee Gees were an early inspiration…We loved their songwriting and beautiful harmonies” as well as Brian May from Queen who says "Of course I was, and am a huge fan of the Bee Gees' creations in music. Undoubtedly at the pinnacle of song-writing considered over the last—30 years”. We can’t wait to see him perform hits like this one on Easter Monday! Join us won’t you? The much loved Boomerang Festival has been hit with cuts to funding for both arts and Indigenous programming. Why does it always happen to indigenous arts & cuture, whilst film and sport always seem to be supported by the current government?. Whilst Boomerang has a temporary home at Bluesfest, it needs upwards of $800,000 to become a stand-alone festival once again and a minimum of $200,000 to present at Bluesfest. The ultimate goal for Festival Directors Rhoda Roberts AO and Peter Noble OAM is to make Boomerang Festival the foremost Indigenous arts and culture Festival in the world. The ambition is huge, but Peter, Rhoda and their team believe the time is right and Australia is ready to step out on the world stage and become known as the destination for authentic and quality Indigenous cultural exchanges. Miles Electric Band, Nahko, Rhiannon Giddens and more added to the touring line up! Bluesfest Touring adds another six highly acclaimed international artists to their already massive touring roster for 2017. We are thrilled to share what makes Easter weekend in Byron Bay so special with music fans in Sydney, Melbourne and Brisbane. 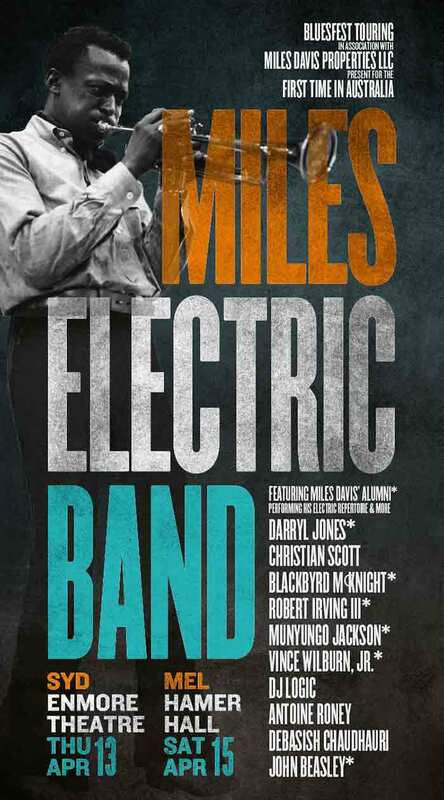 Visiting Australia for the first time Miles Electric Band is a ten member, all-star concert that has been created in association with the Miles Davis Estate to bring his music to new generations. The group features Miles Davis alumni including Grammy nominee Robert Irving III, legendary Parliament Funkadelic guitarist Blackbyrd McKnight, Munyungo Jackson and Grammy winner Vince Wilburn, Jr. (Davis’ nephew) on drums. Darryl Jones, recognised for his recordings with Davis, Sting and decades long tour duty for the Rolling Stones provides the bass backbone. Davis’ long time keyboardist John Beasley also plays with the band. Finding a trumpeter to join this illustrious group was no small task, but when the Davis Estate heard Grammy winner Christian Scott play, they knew he was worthy. 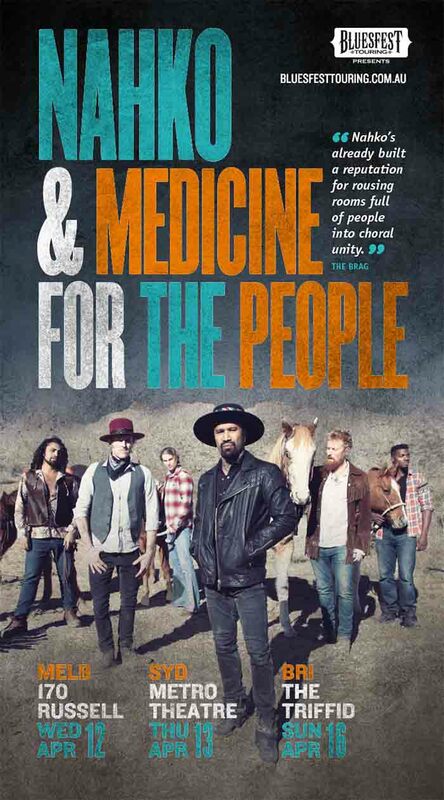 The people have spoken and they can’t get enough of Nahko and Medicine for the People! Bluesfest Touring is delighted to announce they will be bringing their joyful live concerts back to Melbourne, Sydney and Brisbane in 2017. She wowed audiences with her emotional range and dazzling vocal prowess at Bluesfest last year, with many calling her the best act at the festival. 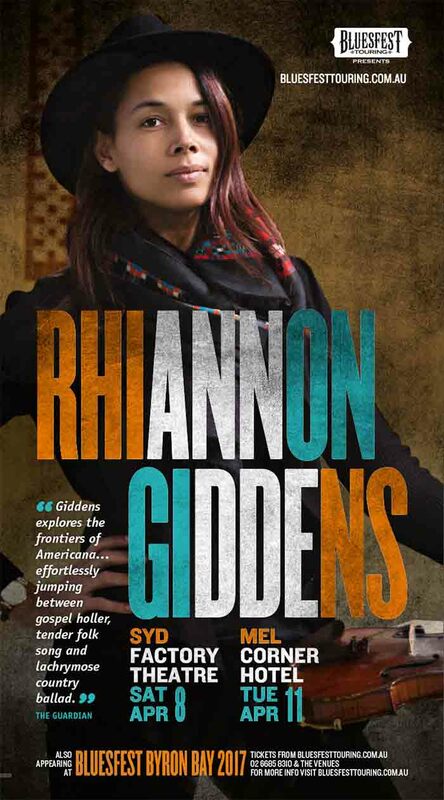 Bluesfest Touring is thrilled to have Rhiannon Giddens touring to Sydney and Melbourne in 2017. 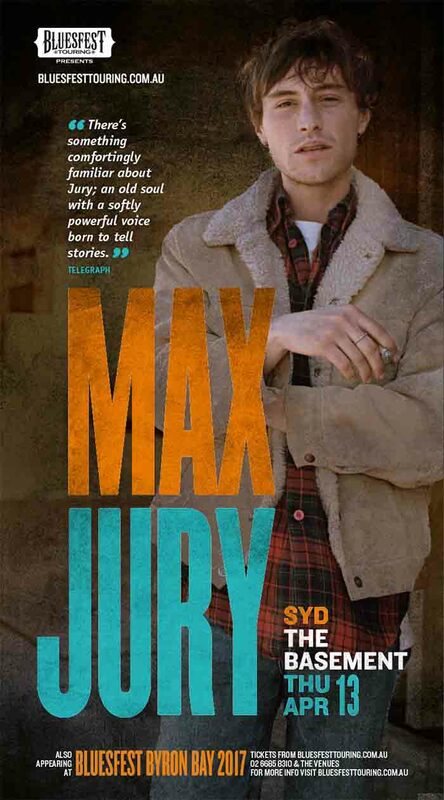 Making his Australian debut, Max Jury comes on like the missing link between Gram Parsons and George Harrison, shot through with the grace of James Blake. An impeccable song-crafter, he’s got one foot in the cornfields and the other in the nearest dive bar whilst his fingers skip across the keys of his Fender Rhodes. One to watch, this is an artist you will be bragging about seeing in years to come. 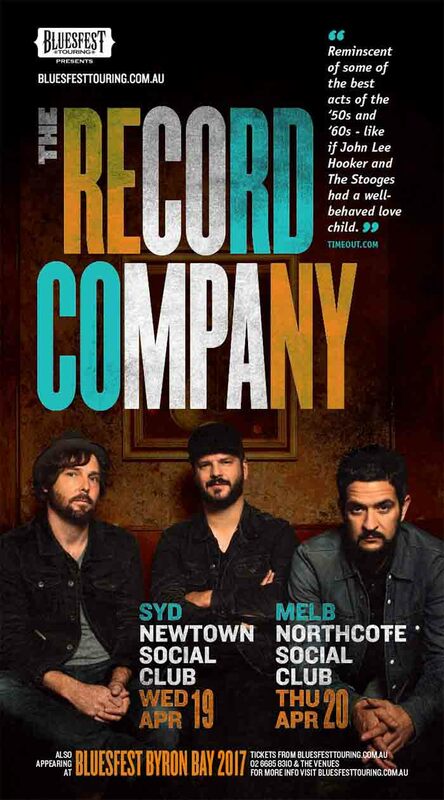 The Record Company are an American rock band formed in Los Angeles, they have taken their hometown by storm, and now they are here to take on Australia! Bluesfest Touring can’t wait for Sydney and Melbourne to discover their raw and sincere sound. They are going to be huge, a real discovery that are the talk of the Blues and Roots community around the world. 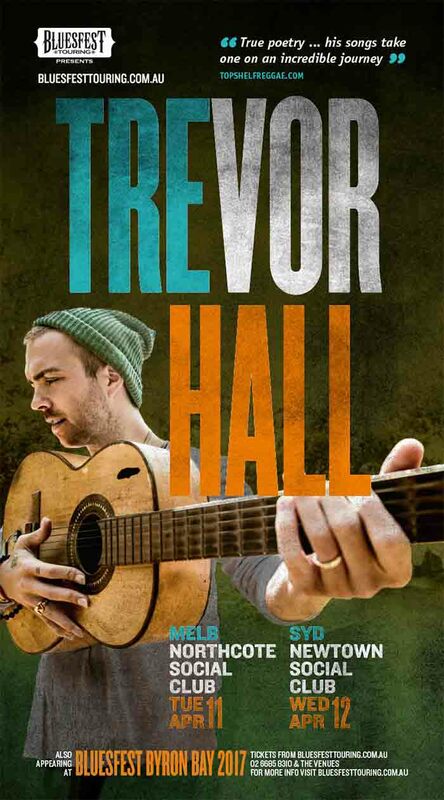 Trevor Hall’s music is an eclectic mix of acoustic rock, reggae and Sanskrit chanting – it echoes with the names and teachings of divinities, while maintaining a refreshingly universal message. Fans in Sydney and Melbourne will have the chance to fall under his spell.